Our inclusion in Remodeling Magazine’s 2013 Big 50. The Big 50 is an annual nationwide ranking of businesses in the building industry that is based on exemplary business practices, management skills, community service, design, and craftsmanship. Our receipt of Angie’s List Super Service Award from 2011 to 2015. Our ShingleMaster designation from CertainTeed, which is their top certification for roofing contractors. This certification means our clients have access to exclusive Hammond roofing warranties, among other benefits. Our certification as a James Hardie® Certified Installer, which lets us offer the available best fiber cement products in the industry. Our certifications that allows us to offer and install Marvin and PlyGem replacement windows. GuildQuality is a nationally-recognized organization focused on independent customer satisfaction surveys, providing honest and unbiased results. The Best of the Best episode highlights our GuildMaster awards for 2014 and 2015. This shows how confident we are with our services – many companies would rather not have themselves surveyed by a third-party surveying company. Our customer feedback from various sites, including the Better Business Bureau and other websites, further vindicate our commitment to providing exceptional service to our customers. Best of the Best also highlighted our community work. This includes our work with Rebuilding Together, a leading national nonprofit organization that helps build and improve homes for low income homeowners – including the disabled, veterans, and seniors – by providing provide labor and materials. Our installations include roofs and windows in Hammond, IN. Another highlight is our support for the East Side Little League team, among several other worthy causes. 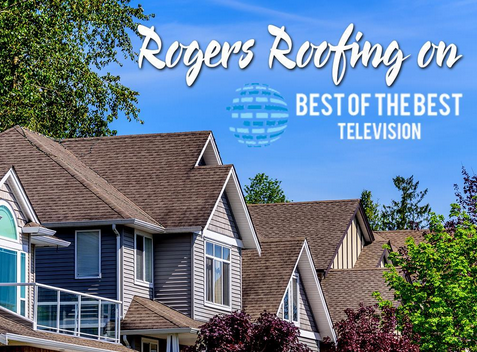 For more information on our services, call Rogers Roofing today at (773) 492-2270 or fill out our contact form for a free, no obligation consultation.